Whether it is a recurring system inventory task or an ad hoc inquiry to gain situational awareness, there are many times you want to get a standard set of information for a computer. Previously, you might right-click “My Computer” and select Properties, or right-click the Start Menu and select System to get some information. You may run msinfo32 from the command line to get a summary information set. If you were already scripting, you may be using VBScript or PowerShell, you may have already had a set of scripts for querying against environmental variables or WMI to pull a standard information set, or are leveraging System Center Configuration Manager. The challenge with all of these various methods is they were either manual data collection via graphical UI, or required numerous environmental variable or WMI queries to compile a useful information set. 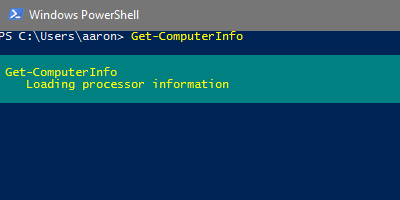 In PowerShell 5.1, the Get-ComputerInfo cmdlet was introduced. Per the TechNet page, it “Gets a consolidated object of system and operating system properties“. In its first iteration, 181 properties are returned! Compare that to the 38 properties displayed on the msinfo32 System Summary pane, and you can immediately get a feel for the potential of this cmdlet. A full example output from my laptop is down below, but here are some filtered information sets you may find useful. The only unique parameter for this cmdlet is Property, where you can specify multiple properties using comma delimiters. Can this computer run Hyper-V? Did you read Use PowerShell to Set Up a Hyper-V Lab and want to know if your computer can run Hyper-V? Here is the Get-ComputerInfo query that will tell you. Note the use of the * wildcard to return all of the HyperVRequirement properties. PS C:\Users\aaron> Get-ComputerInfo -Property "WindowsEditionId","HyperVRequirement*"
What is the computer make, model and serial, and BIOS version? Mileage will vary depending on your system build, but if it is a known manufacturer this should do the trick (note that in this release there is a spelling error for “Serial”). For all BIOS information, try running Get-ComputerInfo -Property “Bios*”. What does the computer have for processor and memory? Here we reformat the results from Get-ComputerInfo for memory, which is returned in KB, to a more readable GB value. What are the Windows OS details for this computer? These combinations were just a few that provide some quick value. If you have suggestions for others, please put them in the Comments to share! Wow – thank you for pointing out my egregious error! I had the output up from msinfo32 when I was writing so I don’t know where wininfo32 was coming from either – I read somewhere that you shouldn’t write at night and this would be proof of that . I have corrected my post text to accurately reflect ‘msinfo32’, NOT ‘wininfo32’. Thank you again! Thx nice article! Very helpful for a powershell beginner like me. Thank you, Matt! Glad you found it helpful.